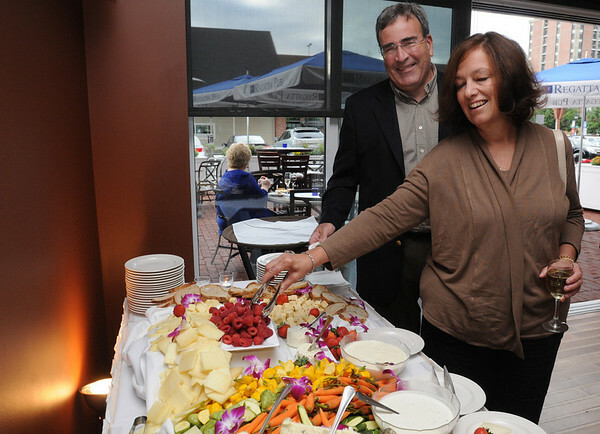 Joanne and John Nester of Marblehead sample some of the various Hors d'oeuvres at the Salem Waterfront Hotel, which is the starting point for the North Shore Mystery Dine Around" dinner to benefit the North Shore Cancer Walk. The people were served cocktails and Hors d'oeuvres at the Regatta Pub before traveling to a "mystery restaurant. Photo by Ken Yuszkus/Salem News, Friday, September 10, 2010.